1ST BDE - Following up on an intelligence report of suspected Viet Cong activity 8 kms north of Saigon near Go Vap, Co A, 4th Bn, 9th Inf made an airmobile assault into the area. In the two days of heavy fighting that followed a combined arms team killed 50 enemy soldiers. Utilizing the hardtop road to Saigon as an Landing Zone, the Manchu infantrymen landed right in the middle of a NVA battalion that intelligence later found out consisted of two rifle companies and one heavy weapons company. As the choppers carrying the Manchus started to land, the hidden enemy opened up with heavy automatic weapons fire. The Manchus jumped from the choppers and took cover on the sides of the road. Undaunted by the hard, swift blow dealt by the enemy, the men of Co A drove to the north and west forming a perimeter of defense. Constantly harassed by automatic weapons and RPG fire, the Manchus held their ground. Artillery, airstrikes, and gunships were deployed to the east and west on the entrenched enemy forces. Two secondary explosions were observed to the east as the result of artillery fire. 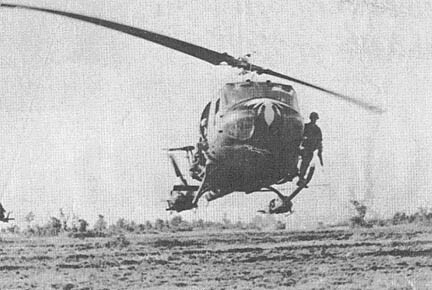 Co B made an airmobile landing to the north and began to move west to tie in with Co A. They encountered heavy resistance and called for artillery and gunships to dislodge the dug-in enemy. 2D BDE - Quick reflexes by a 25th Inf Div team leader in the 1st Bn, 27th Inf Wolfhounds resulted in 21 Viet Cong killed when the enemy was caught sleeping on the job. The action took place approximately 9 kms west of Saigon near the village of Ap Binh Hoa. Operating under the command of 1LT Harvey Anderson, Co C, reinforced by a platoon of tanks from the 2d Bn, 34th Armor, was conducting a local daytime sweep of the area surrounding a proposed night location. Anderson explained that he "had the four tanks deployed to the rear behind our ground troops so they could be maneuvered more effectively in the event of a fire fight." SP4 James Handing, a team leader in the 1st Plt, was moving his men in a file on the extreme right flank of the company, when he noticed a hootch 10 to 15 meters to his right front that had not been searched yet. "I cautiously moved towards the hootch" Handing recalled, "and was really taken by surprise when I stood in the doorway and saw people lying all over the floor sleeping! "At first I thought they might be civilians," Handing continued, "But when I saw one reaching for his AK-47, there was no doubt in my military mind who they were! 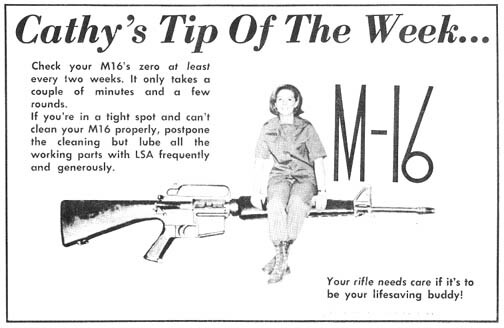 I put my M-16 on automatic and emptied my magazine on them, but I didn't stick around long enough to see how many I got." SP4 Handing had, in fact, stumbled on an estimated platoon of Viet Cong. A 1st Plt grenadier, SP4 William Mielke recalled hitting the ground instinctively and looking in the direction from where the shots came. "I had to laugh when I saw Handing running out of that hootch . . . I've never seen him move so fast!" The tanks from Co A, 2d Bn. 34th Armor quickly moved into position and began taking the hootch under fire. Mielke said, "We all had pretty good firing positions, and when the VC started running for cover in a nearby hedgerow, well, they were pretty easy targets and we got them all." The combined U.S. force sustained only one casualty and were credited with 21 Viet Cong killed in the action. 1ST BDE - Viet Cong hoping to probe the defenses of the 25th Inf Div's 1st Bde base camp at Tay Ninh didn't quite make it after passing a Regional Forces outpost near the perimeter. At midnight, an estimated company of Viet Cong moved toward the brigade's perimeter. Their chosen route took them past the Vietnamese outpost of Cay Xieng, only a thousand meters from the Tropic Lightning post. 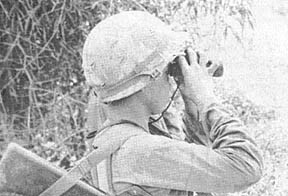 Every evening the outpost sends out an ambush patrol, and on this night they spotted a three-man forward observer team of Viet Cong. The Regional Forces popped the ambush, killing two of the enemy team. The VC force behind the team responded with heavy fire on the ambushers. At the outpost, support troops were sent to flank the embattled patrol. The allied force called for artillery support and received a quick response from the Lancer base camp. The Viet Cong broke contact, leaving behind nine Chinese mines. The Regional Forces took no casualties in their action which had held the enemy from the American camp. The Vietnamese action prompted COL Fremont Hodson, 1st Bde CO, to comment, "The 1st Bde is extremely grateful to the Regional Forces of Cay Xieng, who on that night conducted themselves in such a professional manner, that a VC company was detected and dispersed. This early detection by our allies prevented a probe on the brigade's base camp and potential loss of American lives. Each brigade Lancer salutes the Regional Forces of Cay Xieng for a job well done and takes pride in serving with such professional allies, in the defense of Tay Ninh Province." Two flags, one American, one Vietnamese, each with a special significance, have been presented to the 66th Inf Plt (Combat Trackers) assigned to the 25th Inf Div, who work with the 1st Bn, 27th Inf "Wolfhounds". The American flag was flown over the Capitol at Washington D.C. and, upon the request of the Honorable Edward A. Garmatz, Representative, 3d District, Maryland, it was forwarded to Vietnam. The flag was also flown over Fort McHenry, birthplace of The National Anthem, and over Veteran's of Foreign Wars Post 7472, Endicott City, Maryland, which sponsored the flag. Upon arrival in Vietnam, the American flag was flown over the division base camp in Tay Ninh province. There, a Vietnamese flag, a gift from The Little People of Vietnam and the ARVN Army, joined the American flag on the base camp staffs. On June 9, both flags were flown at Division Headquarters at Cu Chi, at half mast in honor of the late Robert Fitzgerald Kennedy. They were taken down at retreat and turned over to SP4 Alfred J. Provost of the Combat Trackers. 3D BDE - In a furious day-long battle south of Saigon a company of the 3d Bn, 22d Inf, routed an entrenched Viet Cong force and accounted for ten enemy killed. "We were checking out the area as a possible laager site," explained CPT Gerald T. Brown, C Co CO from Cape Girardeau, Mo., "when the VC attacked from their bunkers with RPG rockets." Reacting quickly, the 3d Bde, 25th Inf Div, troopers maneuvered to flank the triangular shaped bunker complex. Without cover from the heavy enemy fire, however, the company had to pull back. "I called in artillery and gunships to soften up the area," added Brown. Throughout the afternoon gunships, artillery, and finally airstrikes alternately pounded the VC bunkers while the Regulars continued to probe the positions only to encounter increasingly intense small arms and RPG fire. As dusk drew near, C Co made a final attempt to drive out the enemy with hand grenades, small arms and light antitank weapons. The bunker-to-bunker battle lasted until darkness when the American troops were forced to withdraw from the area. During the fighting, one enemy soldier surrendered. Several months ago, a service-oriented publication carried a story about an enlisted man who had earned a college degree and further advanced his education by way of in-service technical and academic courses. In a later issue of the publication, a letter to the editor accused this educated enlisted man of decreasing his value to the service and wasting his time. It maintained that the man's degree probably wouldn't help him progress through the enlisted ranks nor gain warrant or commissioned status. The man who devoted his off-duty hours to further his education demonstrated that he had the initiative, desire for self-improvement and tenacity sought and desired in leaders whether officer or enlisted. The viewpoint expressed by the critic of education has become a necessity in our modern military establishment. Whether your course of study is directly related to your military assignment - such as personnel administration or management, data processing or computer programming - or is one that broadens your general knowledge and viewpoint, it will help you to be a more useful and productive member of the military establishment, the community and the country. You gain by increasing your education and preparing yourself for more responsible and rewarding assignments. When you do not further your education and seek to improve yourself, you waste time and opportunity - rare commodities indeed. (AFPS). Although the established conversion limit on money for persons leaving Vietnam is $200, unit commanders may authorize the purchase of additional US currency or dollar instruments for persons with a bona fide emergency or departing for PCS, TDY, R&R or leave. The unit commander must certify the excess money was acquired legitimately and provide the certificate stating his authorization to the individual for attachment to MACV Form 385. Simply stated, when a member departs on PCS with more than $200 to be converted, an addition will be made to the Installation Clearance Form stating "Conversion Certificate Issued" and initialed by the commanding officer. In the case of departing on leave, TDY or R&R, the orders will state "Commander's Certificate concerning acquisition of MPC will be prepared by the unit, as necessary, prior to departure of individual concerned." The commander of a replacement battalion or OIC of the out-processing point cannot be expected to be aware of the facts regarding the individual's acquisition of funds. This is why unit commanders are responsible, as the necessary information is immediately obtainable to them. If an individual arrives for out-processing without a certificate authorizing conversion of more than $200, the OIC or his designated representative at the processing point can authorize conversion. Separate records are then filed. If the amount is excessive, the full particulars will be sent to the unit commander for investigation and appraisal. Have you wondered about the Vietnam Service and the Vietnam Campaign medals? The Service medal is an American award which shows service in Vietnam whereas the campaign medal is a Vietnam award given to those who serve in the country for six months. The Vietnam Campaign Medal (VCM) is authorized by the Vietnamese Government for each member of the U.S. Forces who has served at least six months in the country. There are two small devices designed for the medal (or ribbon), one which is marked "49-54" for those who served six months in RVN between 8 Mar 49 and 20 Jul 54, and another marked "60-" for those who have served six months in RVN since 1 Jan 60. A facsimile of a post card application for Absentee Ballot was included in the paper. This application for an absentee ballot must be signed by your adjutant or authorized by a commissioned officer. The card may be obtained from your voting officer. Mail the application to your state official. Your CO can furnish you with all pertinent information. This is your last chance to file your ballot. So be quick! Ballots for Virginia must be in by July 9. The Arkansas deadline is July 30. Exercise your right to a free vote. It's one of the basic principles that the USA was founded upon. It is your right, privilege, and duty to vote for the government you want. So don't delay! The motto, Deeds Not Words, has inspired the men of the 2d Bn, 22d (Mech) Inf, throughout their long and colorful history. As they made their way through two thousand meters of jungle to relieve American forces at the Battle of Soui Tre, a commander of one of the companies they were assisting was prompted to say, "They're the most beautiful sight in the world! " The Triple Deuce, as the battalion is called, was formed on September 21, 1866, when the 13th Inf Regt was redesignated as the 22d Inf Regt. From 1868 until 1898, the Triple Deuce fought in several major Indian Wars including the Little Big Horn. 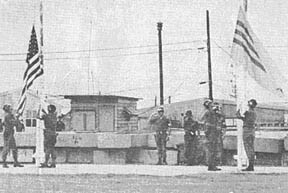 With the outbreak of the Spanish American War, the 2d Bn with its parent regiment led the way to and constituted the first American troops on Cuban soil. In 1899, the 22d Inf departed for the Philippine Insurrection and remained there until the end of hostilities in 1901, taking part in five major campaigns including the battles of Manila, Luzon and San Izidro. In World War II, the Triple Deuce received campaign streamers for the battles of Normandy, Northern France, Rhineland, Ardennes-Alsace and Central Europe. On September 21, 1966, advance elements of the Triple Deuce arrived in the Republic of Vietnam. By the 13th of October, the entire battalion had landed. From that time, the battalion has been involved in several operations. Included in these are Cedar Falls, Junction City I, II and III, Diamondhead, Yellowstone I and II, Resolved To Win and Complete Victory. The crest has a deep tradition in the history of the Triple Deuce. It is the badge of the V Army Corps in the Spanish colors charged with royal palm, to commemorate the fact that this regiment was the first to land on Cuban soil in that war. The 2d Bn, 22d (Mech) Inf, has been recognized for courage and distinction on several occasions. It won the Distinguished Unit Citation for the battles of Hurtgen Forest, St. Gillis-Marigny and Carentan during World War II. The Triple Deuce was cited in the Order of the Day of the Belgian Army for action in Belgium, and for action in Ardennes. 3D BDE - A recent early morning operation by units of the 2d Bn, 12th Inf, netted one VC killed and nine suspects detained for questioning. Bravo and Alpha Cos of the 3d Bde, 25th Inf Div, unit were moving into position around a village east of Dau Tieng. Two members of the force, 1LT Earnest E. Tuggle of Los Angeles, Calif., and SGT Richard Bell of Bremerton, Wash., spotted a man dressed in a gray NVA shirt, complete web gear and carrying an AK47. The man left a house and started down a trail a short distance away. When he halted suddenly as though sensing the presence of the Americans, Tuggle's platoon opened fire, killing the VC. The man was found to be carrying four magazines, additional ammo, and a first aid pouch in addition to the AK47. The shots fired by the platoon alerted eight other enemy soldiers who were seen fleeing the village by SGT Charles Wickliffe of Louisville, Kentucky. 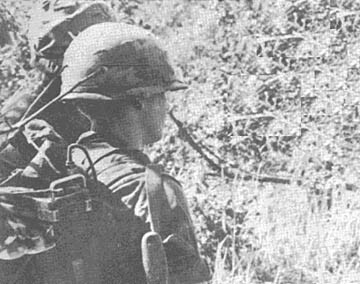 "I couldn't open fire on them," stated Wickliffe, "They were moving through an area directly between my position and Alpha Co."
Later in the day, as the units prepared to move out of their positions at the village, G.I.s of Bravo Co were again involved in brief action as about 25 VC mortar rounds narrowly missed their mark, landing within 50 meters of the troopers. Nine persons who had been questioned by the Vietnamese National Police were escorted back to Dau Tieng by Alpha Co for further interrogation. 3D BDE - Armed only with two small shovels, a bit of spare time and an insatiable curiosity, two artillerymen attached to the 2d Bn, 12th Inf, dug a 14 foot tunnel. "We thought we would see how hard it is for Charlie to make his tunnels," commented SP4 Robert Van Norton and PFC Marty Coriaty, artillery radiomen of the 2d Bn, 77th Arty. The three foot high tunnel, dug at the 3d Bde, 25th Inf Div's fire support base Perry, took only two and a half hours to complete according to Coriaty. Building the tunnel was surprisingly easy, both men agreed. The new facility, which affords a cool spot on hot afternoons, extends from their hootch to a previously completed bunker. Admirers of the underground thoroughfare have gotten a "we did it with our trusty shovels" response from the tunnel-digging duo. LOOKING AHEAD - Vo Van Nam's first-hand knowledge of Viet Cong tactics enabled him to spot signs of enemy activity that U.S. soldiers might miss. 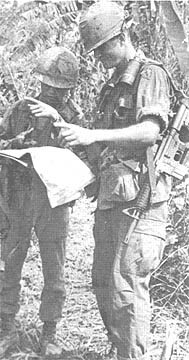 NAM'S SKILL at map reading always amazed 1LT Robert Popken, commander of Co C, 2d Bn, 14th Inf. NAMINSKY - Nicknamed "Naminsky", Vo Van Nam became a close friend of many 25th Inf Div soldiers. 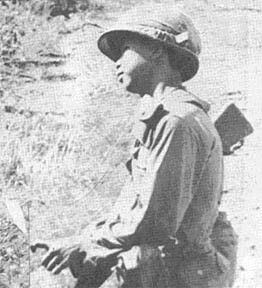 MOMENTS BEFORE DEATH - Vo Van Nam listens for enemy fire-direction before he advances toward enemy position where he was killed during a battle involving company of North Vietnamese Regulars and his American comrades of Charlie Co, 2d Bn, 14th Inf. 1ST BDE - Of the many Viet Cong that rally under the Chieu Hoi program, none are more valuable or memorable to the 25th Inf Div soldiers than the Kit Carson scouts. Vo Van Nam was one of a half dozen scouts working with the 2nd Bn, 14th Inf in their continual efforts against the North Vietnamese and Viet Cong. Born in 1950 in Tay Ninh Province, South Vietnam, Nam died in action on May 23, 1968, against the enemy with which he once fought. Nam grew up in a middle-class Vietnamese family. At the age of 16, he joined the local Viet Cong guerrillas and left his home. According to Nam, "VC come through village and say them number one." Two years of constant fighting, running and hiding went by as Nam lived the life of a Viet Cong terrorist. In September of 1967, his fighting with the communists came to an end. Nam's father was a lieutenant in the Army of the Republic of Vietnam (ARVN), and when Nam found out that the communists intended to kill his father, he laid down his Chinese built weapon and turned himself in to the South Vietnamese government under the Chieu Hoi program. Realizing his skills and knowledge of the enemy's tactics, the 25th Inf Div, at Nam's request, accepted him as a Kit Carson scout and assigned the 18 year old convert to the 4th Bn, 9th Inf. 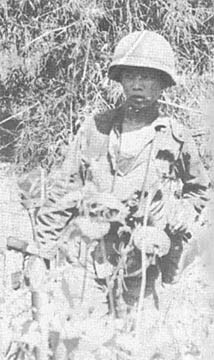 After a months duty with the "Manchus" battalion, Nam was given a three-day pass and returned to his home at Tay Ninh. Nam recalled this occasion with grief on his face. While visiting with his parents in their concrete-floored home at the edge of Tay Ninh, tragedy struck! "VC surrounded our village and called poppa san. Lieutenant Nam, Lieutenant Nam!" recalled the Vietnamese Kit Carson, as he spoke in broken English to his American friends. Lieutenant Nam's last request was that his son escape. Nam ran out the back door just as the Viet Cong attacked the house and killed his father. The grieved and terrified scout made his way back to the Manchus and continued his duties. His performance with the Manchus was one of endless courage as he searched for those who killed his father. In February of 1968, Nam joined Co C, 2nd Bn, 14th Inf, and the soldiers of the "Golden Dragon" battalion gladly received their new comrade. It didn't take long for the Dragons to learn just what type of a man Nam was. "Nam couldn't speak English very well that first night we met him back at base camp, but he had the most pleasant smile I've ever seen," remarked PSG Marvin M. Czerwonka of Chetek, Wisconsin. "We took a quick liking to him and as days went by we learned to appreciate his knowledge of enemy tactics even more," stated SP4 James L. Herriage Jr. of Heflin, Louisiana. "We got tired of calling him Nam and he became so close to us that we decided to call him Naminsky," remarked one Co C soldier of Polish ancestry. Many a battle went by as he participated with the 'Dragons' in operations against the enemy from Saigon to the Cambodian border. Why were Naminsky and the many other scouts assigned to the 25th Div, called Kit Carson scouts? "In reading about the early settlement of America, men like Kit Carson guided the 'greenhorned' Easterners out west to settle a new frontier. Nam was an advisor and looked out for our welfare because, like early American settlers, we infantrymen are involved in an area where experience and knowledge pays off," said 1LT Robert E. Popken, CO of Co C.
"As a Kit Carson scout, Nam looked for various signs and symbols used by the Viet Cong in marking booby-trapped areas, enemy base camps, and tunnel entrances. He also advised us of danger areas, enemy base camps, possible enemy sniper positions, as well as helping us feel more confident in our efforts," praised Popken of Sleepy Eye, Minn.
"Finding wild fruit, climbing up in the palm trees to retrieve fresh coconuts, and cooking up one of his famous campfire recipes, were a few of the many ways Nam made life more pleasant for us," relates SGT Danny C. Hatmaker of Welch, W. Va.
"Naminsky did all sorts of things and was all over the area looking for 'Charlie'," continued SP4 Jose A. Ramirez. "He wasn't afraid of anything. If there was action anywhere, he'd find it." "I remember a battle we had down by the Saigon River when Nam forfeited his three-day pass after pay day, and flew out on a resupply chopper to help us out," recalled SSG George R. Axtell of Galesburg, Michigan. "He brought us a badly needed starlight scope and lots of cigarettes for the men." Volunteering to go on night ambush patrols, walking at the head of the company in search for booby traps, and carrying extra cigarettes for his pals, were only a few of the things for which Nam was noted. As for how the enemy felt about Nam, the men of Co C recall a recent ambush patrol when Nam found three armed, enemy suspects in a search through a tunnel complex 29 kms northwest of Saigon. The next morning while interrogating one of the detainees, the interpreter got a distinct reply in answer to the question, "Do you like Nam?" "Nam is too fast and he would have killed me if I hadn't given up. No, I don't like Nam," concluded the suspect. The men of Co C laughed as they walked over and patted their Vietnamese comrade on the back and said, "Good job Nam, you're one of us." EDITOR'S NOTE: While "Kit Carson of Vietnam" was being written, Vo Van Nam was killed in action against a Viet Cong f orce. The article was completed as a tribute to the skill, dedication and courage of Nam and the many other Kit Carson scouts serving with the 25th Inf Div in Vietnam. WALKING FLANK - Vo Van Nam often volunteered to walk flank in search of the enemy on reconnaissance in force missions. 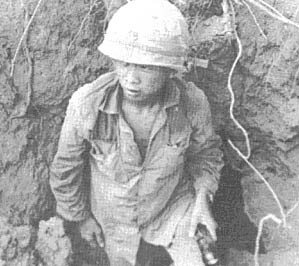 TUNNEL RAT - Nam's two years with the Viet Cong made him a highly skilled "tunnel rat" when he joined the U.S. 25th Inf Div. FRIENDS - The men of the 2d Bn, 14th Inf, accept Kit Carson scouts as friends and valuable assets to their unit. Nguyen Van Ngong, far right, has a Kit Carson job to be done. Vo Van Nam gave his best and is remembered by all. 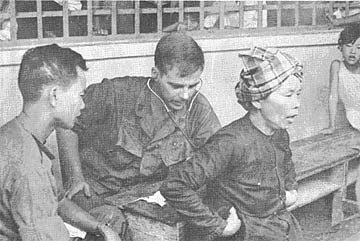 1ST BDE - Examination of Communist documents found with various medical supplies and two live rats startled a 25th Inf Div rifle company during operation Toan Thang. Soldiers of Alpha Co, 2d Bn, 14th Inf, discovered the underground aid station while sweeping the northern Filhol Plantation 30 kms northwest of Saigon. "We came upon this Viet Cong campground and were finding a lot of food supplies," said SP4 James H. Cook of Troutman, N.C. "It wasn't until I found the rats in a cage that I started thinking about just what kind of a deal this was! " A thorough search of the tunnel turned up many glass injectors used to inject serum into the blood stream along with numerous medical supplies. The rats, medical supplies and documents were evacuated to the Dragons fire support base and turned over to their intelligence section. SSG Pham Hugh Hung, a South Vietnamese Army interpreter working with the Dragons, examined the documents and his findings were of great interest to the men of Alpha Co. Documents proved that the Viet Cong were experimenting with a serum to combat the rabies disease. The disease had killed 10 of their soldiers in the past. 2D BDE - Occupancy of a spacious new fire direction center (FDC) climaxed a week-long construction project by men of the S-3 Section, 1st Bn, 8th Arty. The section, located at Fire Support Base Harrison near Hoc Mon, directs artillery fire in support of the 2nd Bde, 25th Inf Div. Tired of working out of a cramped bunker and a 2 ½ -ton van, Bn S-3, MAJ Wilburt Jenkins and SFC Fordon Kirksey, operations sergeant, drew up plans for a fully integrated fire direction center. Five days and 5,266 sandbags later, the 16 by 32 by 6 ½ foot structure was completed. Without even a moment's pause in the fires of the battalion's three organic batteries and three attached batteries, section personnel moved their radios, telephones, charts, maps, and other equipment into the integrated FDC. The new structure - unique in that permanent FDC's are usually built only in base camps, combines the tactical, technical, and operational responsibilities of the artillery S-3 section under a single roof. The battalion's S-3 staff is responsible for obtaining clearances for artillery fires within the 2d Bde's tactical area of operations, and for maintaining the capability of massing the fires of the battalion's six howitzer batteries upon a single target. The latter was demonstrated when a multi-battery "time on target" mission was fired using battalion firing charts shortly after the section had occupied the new bunker. "The only thing I hope," commented Chief Computor SSG Manuel Crusto, studying the new surroundings, "is that we get to enjoy it for awhile." Grinning, he added, "After all, the mission of the artillery is to 'move, shoot, and communicate'. We can shoot and communicate right where we are, but if we have to move ... well, I don't know if we can take it with us!" 1ST BDE - After five blistering hot, dry, dusty months in the thick jungles and dried rice paddies, the 4th Bit (Mech), 23d Inf, returned for a well deserved five day rest and maintenance stand at Tay Ninh base camp. It was a hard five months marked by two major communist offensives and highlighted by two successful operations - Quyet Thang and Toan Thang. 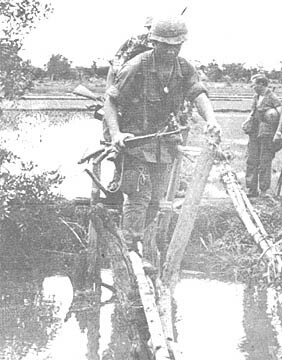 Whether they were securing the vital Hoc Mon Bridge, an artillery fire support base, convoys down Highway 1 or sweeping on reconnaissance in force missions from Tay Ninh through Trang Bang, Cu Chi and around Tan Son Nhut, the Tomahawks and their armored personnel carriers kept constant pressure on the enemy. Very frequently the enemy was forced to lock horns with the combat-experienced Tomahawks and he paid dearly as evidenced by the 568 enemy body count tolled in five months. The enemy became weaker not only by the lack of personnel but also by the loss of ordnance, as indicated by the 106 individual and crew-served weapons captured. In addition to the weapons, nine tons of rice and numerous documents were captured. 3D BDE - Planting a mine in the path of the Recon Pit of the 2d Bn (Mech), 22d Inf, proved a fatal error for two Viet Cong in Tay Ninh province. Spotters in the lead armored personnel carrier escorting a convoy from Tay Ninh to the 3d Bde, 25th Inf Div, base camp at Dan Tieng saw wires lying across the road. The convoy was halted while the wires were checked out. They led from an electrical pressure trigger to a large block of explosive charge planted in the road. While the road was being cleared, security elements pushed out into rubber trees lining both sides of the road. SP4s Robert Thompson of St. Louis, Mo., John Fahse of Burleson, Tex., and Richard Marrero of New York City, N.Y., flanked out quickly to one side. Coming upon two woodcutters, Thompson and Fahse questioned the duo while Marrero pressed forward. "Suddenly I saw six armed Viet Cong a little deeper in the rubber hiding behind a hootch. I called Thompson and Fahse and we started toward the six when they began shooting at us," Marrero said. Thompson immediately lobbed grenades near the sextet, while Fahse moved out to the left and Marrero to the right. "The VC apparently lost sight of me, but opened up on Fahse, who let loose with his weapon, cutting one down. At that point they started to run and I opened up, killing another," Marrero said. Then armored personnel carriers drove up and sprayed the area with machine guns. A search of the area recovered two bodies along with two weapons and several blood trails leading off into the plantation. 1ST BDE - Soldiers of the 25th Inf Div repulsed an early morning ground attack on the 1st Bde's base camp by an estimated Viet Cong battalion. Under the cover of mortar, 122mm rockets, and RPG fire, a small enemy force penetrated the perimeter but were quickly driven back leaving seven dead and a variety of explosives and equipment. After a three-hour fight, Tropic Lightning forces found 36 pounds of explosives, 2 AK-47 rifles with 100 rounds of ammunition, one RPG rocket launcher with two war heads, 8 grenades, 4 RPG boosters, and 20 electrical blasting caps. The defenders were supported by artillery and helicopter gunships from the 2d Bn, 32d Arty; 7th Bn, 11th Arty; 3d Sqdn, 17th Air Cav. Damage to the base camp was light. 1ST BDE - Soldiers of a 25th Inf Div rifle company received an early morning surprise at their night ambush site by discovering that they were positioned in the middle of an enemy base camp. Co C, 2d Bn, 14th Inf, uncovered the company-sized base camp during an ambush patrol 30 kms northwest of Saigon. "We had spotted some small tunnels as we moved into the ambush site, but it wasn't till the next morning that we found out about it being a base camp," related 2LT Francis J. Culkin of Philadelphia, Pa.
"As soon as the sun came out the next morning, the men started nosing their way around and found enemy supplies left and right," added the platoon leader. An underground fire direction center (FDC) with various instruments, colored pencils, mathematic charts, and aiming directions were found in the tunnels. A large underground hospital, a Viet Cong mess hall and storage area for explosives were the most interesting spots in the camp according to SP4 Thomas M. Winston of Panama City, Fla.
"That 200 pounds of Chinese communist explosives was sure heavy as we packed it out of the holes, but I'm glad we found it," stated Winston. "Charlie could have made some mighty dangerous hand grenades if we hadn't found it." In addition to the 200 pounds of Chinese communist explosives, and the FDC equipment, 1 AK-47 assault rifle, 1 75mm Chinese communist recoilless cartridge, 3 RPG-2 rockets, 2 boosters, 50 rounds of small arms ammunition, 1 anti-tank mine, NVA web gear, food, clothing and numerous documents were captured and evacuated. 1. What horse won the 1967 Kentucky Derby? 2. What major league baseball club had the best record during the 1967 exhibition season? 3. Who won the 1967 Phoenix Open Golf Tournament? 4. Who was the top free throw shooter in college basketball in 1966-67? 5. Who led the National League in times at bat last season? 2. The San Francisco Giants with a 17-9 record. 3. Julius Boros, fourth leading money winner on the pro circuit last year. 4. Bobby Lloyd of Rutgers with 255 out of 277 for a .921 percentage. 5. Lou Brock of the St. Louis Cardinals, 689 times at bat. Almost daily, quantities of ammunition are discarded in the sanitary fill or elsewhere on post, ranging in size from small arms to 155mm shells and from grenades to cratering charges. Military police continually find ammunition dropped along the highways and have even observed children picking up ammunition dropped from helicopters near the camp. Much of the ammunition is not recovered by U.S. forces. A lot of it found its way into enemy hands to be fired back at us or used in mines. In addition, three known deaths have occurred to Vietnamese civilians in the Cu Chi sanitary fill, and a child, a 72-year-old man and a 50-year-old man were killed recently near Tay Ninh when the child picked up an object. Don't drop ammunition, dispose of it in the correct way. Unserviceable ammunition must be turned in to the supporting ASP or depot where it will be packed and marked. The unserviceable ammunition will not be fired. Want to read about your award or promotion in your home town newspaper? The Information Office wants to break the news to the folks back home via your home town newspaper. But, we need your help. When you get an award or promotion, contact your unit's Information Specialist (listed below) right away and fill out a Home Town News Release Form, DA Form 1526. We'll do the rest. Don't wait act now - the family back home is watching for your name in the paper! 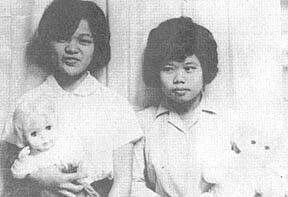 Two American blonde-haired blue-eyed baby dolls - that close their eyes and talk, fulfilled the dreams of two young Vietnamese girls at. Cu Chi Base Camp. Dung and Lan have worked at their jobs since Cu Chi became the base camp for the 25th Inf Div over two years ago. The two dolls given them are the finale of a series of events which help to point up the relations between the peoples of Vietnam and the United States. They and several other girls from the area gave up a large portion of their pay to have 30 Vietnamese dolls made up to be sent to America as a gesture of friendship to the people of the United States and as a representation of typical Vietnamese dress and costume. Lan asked if it were possible that one doll could be, in her words, "on the desk of the President so everyone could see it." SP5 Charles A. Walker, stationed at Tay Ninh, was to take some of the dolls home to Maryland with him to give to the Vietnamese girl's "friends" in America when he went on leave last December. He gave two to Congressman Edward A. Garmatz, 3d District, Maryland, to forward through channels. Congressman Garmatz put one of the dolls on his own desk where it was seen by many constituents and forwarded the other to the White House. Walker recently received a letter from the White House stating the President received the Vietnamese doll and two Vietnamese flags also enclosed from the Vietnamese girls as a token of their appreciation and friendship. It was signed in President Johnson's own hand. In his words, the President's letter concluded, "This gesture of friendship means much to me and I hope you will be able to convey my deep gratitude to those civilians ... especially the young lady whose letter you enclosed." Dung, the young girl now working with the Division Band, made a tape recording of the National Anthem which has been forwarded to Congress. The two girls were presented American dolls from the United States at the Post Exchange at Cu Chi June 8 as an unexpected return favor. Determined soldiers, the Manchus fought hard and tenaciously held their ground. Disregarding heavy enemy fire, they pulled back their wounded pinned down by the Viet Cong. One such attempt resulted in a hand grenade fight as a wounded soldier was rescued. After evacuating their wounded, Co A pushed north and formed a night perimeter with B Co and A Co of the 1st Bn, 27th Inf. The next day, airstrikes and artillery pounded the enemy positions. In a sweep through the area, the Manchus found 50 dead enemy soldiers, 57 destroyed bunkers, and captured 11 AK-47 rifles, 1 AK-50 and an assortment of enemy equipment. "The courage, aggressiveness, and determination of the Manchu infantrymen was the factor that changed impending disaster into a hard-fought victory over the Viet Cong," commented LTC Richard Simpson, Bn CO.